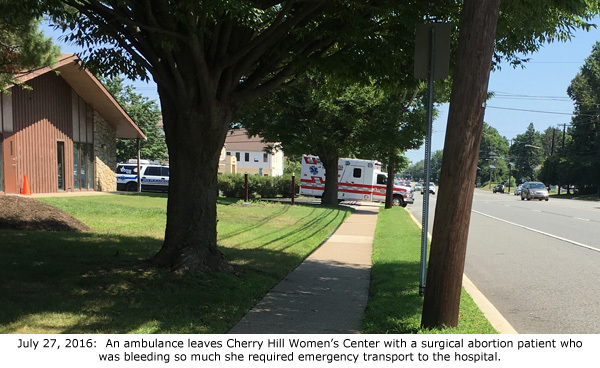 Cherry Hill, NJ — The Cherry Hill Women’s Center (CHWC) in Cherry Hill, New Jersey, has been the site of at least two confirmed medical emergencies in less than a year. The CHWC caller indicated that the patient was “stable” but still required emergency transport to the Cooper Medical Center. Paramedics from Virtua EMS arrived separately from the ambulance to treat the bleeding woman. Little more is known about her condition. It appears the abortion of her baby had already been completed. A previous emergency took place on September 12, 2015, when another ambulance was seen leaving CHWC. The CAD printout that was obtained by Operation Rescue did not indicate what condition prompted the need for the emergency transport of a patient to the hospital. Operation Rescue acknowledges that the record of medical emergencies at abortion facilities is only a small fraction of the total number of abortion complications that happen each year, especially since most complications do not manifest until after the patient has left the facility. Because there is no accurate reporting of abortion complications and deaths in every state, there is no precise way to know the actual number of abortion complications, which Operation Rescue estimates could be in the tens of thousands each year. MUST READ RELATED CONTENT: Read about Eric Yahav, one abortionist at Cherry Hill Women’s Center, and how he handled it when his girlfriend became pregnant!